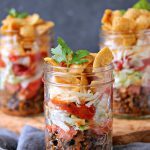 These individual Mini Fritos Taco Salad in Jars are the perfect dish to whip up for potlucks or picnics. They are incredibly easy to make and you can customize them to your own taste. This post has been sponsored by Frito-Lay. All opinions are my own, as always. Thanks to all the companies, and readers, who help support Cravings of a Lunatic. This recipe goes back to my teenage years. It’s been around that long. I actually learned how to make a different version of this in home economics while I was in high school. Let’s not even talk about how long ago that was. 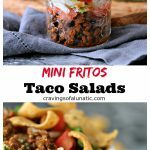 When Frito-Lay asked me to participate in their campaign for summer recipes I knew this Mini FRITOS Taco Salad was a perfect fit. Then I jumped up and down a little. I’m a huge fan of Frito-Lay products. Of course I acted professionally and did not say things like “I’ve been training for this my whole life” or “It’s like my home planet is calling me home”. That would be a dorky thing to do. We all know I’m above making a fool of myself. Always. The goal here was to make something perfect for summer entertaining. 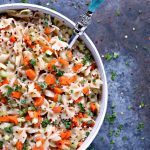 Something that would be easy for others to whip up at home, or while out whooping it up during holiday weekends. This fits the bill, and then some. This recipe is super easy to make and very customizable. You can add things that speak to you. Not literally, because that would be weird. You can also subtract things you don’t like. Although I’m not sure how you could not find this to be anything but perfection. You know, in my humble opinion, and all that jazz. If you like olives toss those bad boys in there. If you like beans, those can get thrown in there too. If you like chicken better than ground beef, well, knock yourself out. Add chicken. No biggie. It’s all good in the hood. Or jar. Whatever. 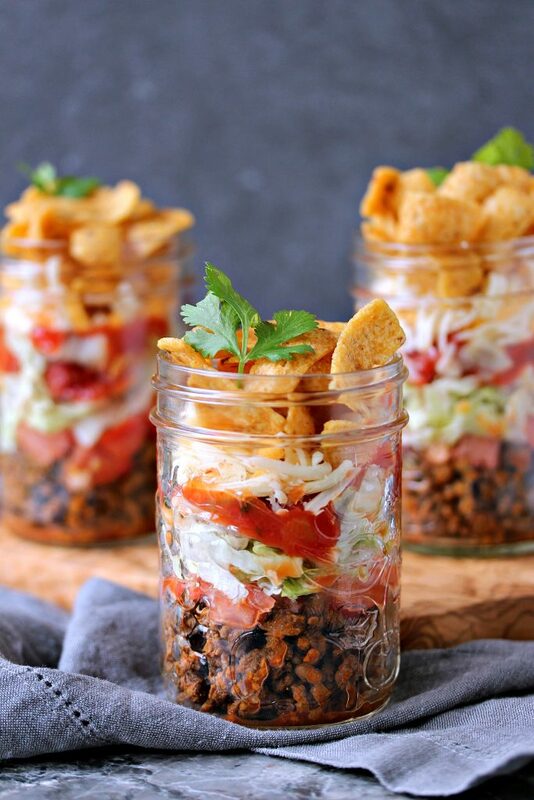 One thing I will highly recommend is if you are making these ahead of time do NOT add the FRITOS until you are ready to serve these cutie-patootie little jars of happiness. If you add the FRITOS too soon they will be soggy. So wait. Seriously. Trust me on this one thing. You want your FRITOS crisp and perfect. As they should be. Always. I serve mine hot so this is something I try to make right before we have company. Having said that you can also serve this cold. Many people do. There’s a slight alteration if you serve this cold. Add a little Italian dressing to it. Shake it all up and it becomes magical. Many people use Catalina dressing in their versions of FRITOS Salads. I just happen to be more of an Italian dressing kind of gal. No harm, no foul if you’re a Catalina type of person. You do you. Use whatever works for your own taste buds. You’re the one eating it, so feel free to adjust to your own taste. That’s the beauty of cooking. This recipe is the perfect way to kick off summer. Frito-Lay products are served at every single summer function we throw at our house. Since as far back as I can remember. They are a staple in our house for entertaining. 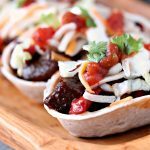 If you’re looking for more awesome summer hacks for Memorial Day, or summer entertaining in general, be sure to check out the Frito-Lay Summer Hacks Pinterest Board. You’ll find oodles of inspiration for your next soiree. 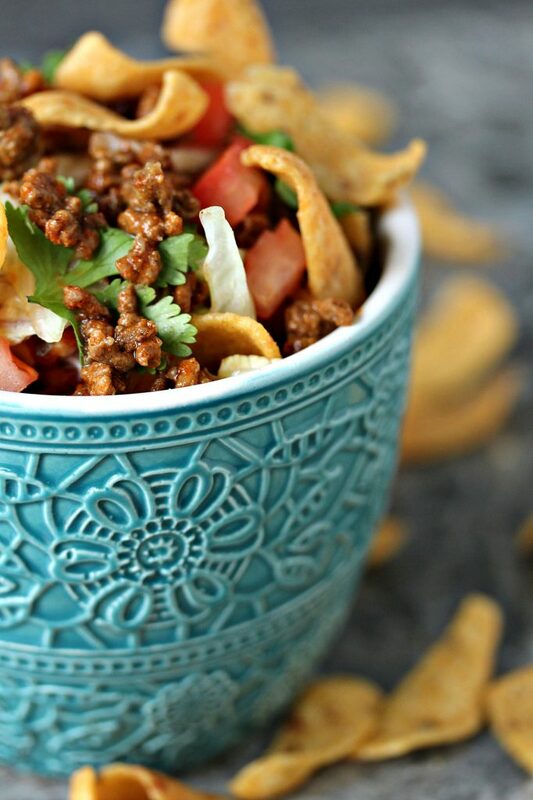 In the meantime whip up some Mini FRITOS Taco Salads. I assemble mine in tiny mason jars so everyone gets their own individual jar. Then you just flip that bad boy upside-down into a bowl, and blammo, you have a delicious meal to dig into. Perfection in tiny little mason jars. Enjoy! Cook the ground beef over medium heat until the juices run clear, making sure to break up the meat as you cook it. Brown slightly. Add taco seasoning and 1/2 cup water. Cook over medium-low heat until the water dissolves. You don't want too much juice or your taco salad will be a soggy mess. Chop up all your other additions and set them aside. Start stacking your jars, remembering to put the wet ingredients at the bottom and the dryer ingredients at the top. Garnish with cilantro if desired. Don't garnish until serving or it will overwhelm your salad. If you plan to make these ahead of time and serve them cold you need to make one small adjustment. Add Italian dressing to each jar (do NOT add Fritos until just before serving so they stay fresh and crisp! ), place the top on, and shake it like crazy. Pop in the fridge and allow it to work it's magic. Add FRITOS and cilantro just before serving. Serve with a big old Frito-Lay loving smile! Thanks for joining me today. Be sure to check out my FRITOS Pie recipe while you’re here. It’s delightful! While you’re here make sure you follow me on Pinterest and Instagram. 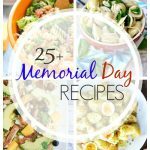 Both are excellent ways to keep up with all the latest and greatest recipes. All my new recipes post to both so you’ll never miss a thing if you follow me. Hope you enjoy this recipe and poke about my recipe index a bit while you’re here. Happy Cooking. Awe, thanks so much Sue. I love popping salads in mason jars. I pretty much loving popping everything in mason jars. There’s something about them that makes me happy. Plus I love that they are portable. Thanks so much Adriana. I loved working on this one. Such a cute idea! Love them in the little mason jars! Thanks so much Rebecca. I’m a mason jar fanatic. Wowzer! This salad is gorgeous and I love the crunchy fritos on top. What a fun recipe that I am ready to dig into. Thanks so much Christie. I had a blast with this project. Thanks so much Heather. We loved them. 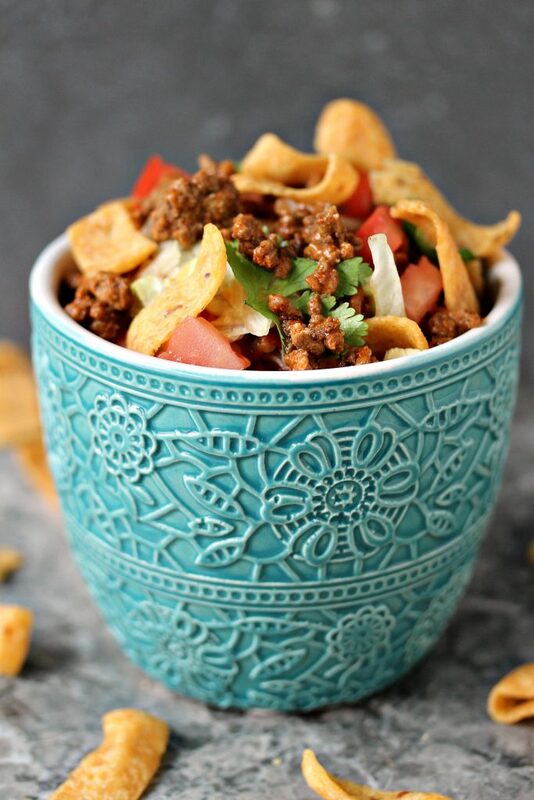 OMG Fritos are so delicious and addicting, what a creative way to incorporate them into a recipe. This looks so good! Thanks so much Emily. I agree, I love Fritos. They’re so good. One of my favourite snacks. 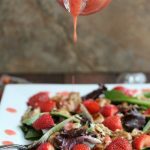 Fritos in salad? Oh yeah!! These look so perfect for picnics or dinner on the deck. Great recipe, Kim! Thanks so much Stephanie. We love this recipe. It’s been around since high school. Funny to think back that far. Oh my gosh! 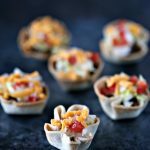 I love these mini Frito taco salads so much. I can see bringing them on picnics, fishing trips, road trips, etc. They’re the perfect portable portion. Thanks so much Renee. We love bringing them on trips. Been doing it since I was a teenybopper. Never get tired of this recipe. 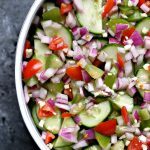 These salads are so fun! You are a creative genius! Thanks Lauren. Nah, these were born out of laziness and leftovers. That’s where all the good ideas come from. Ha. 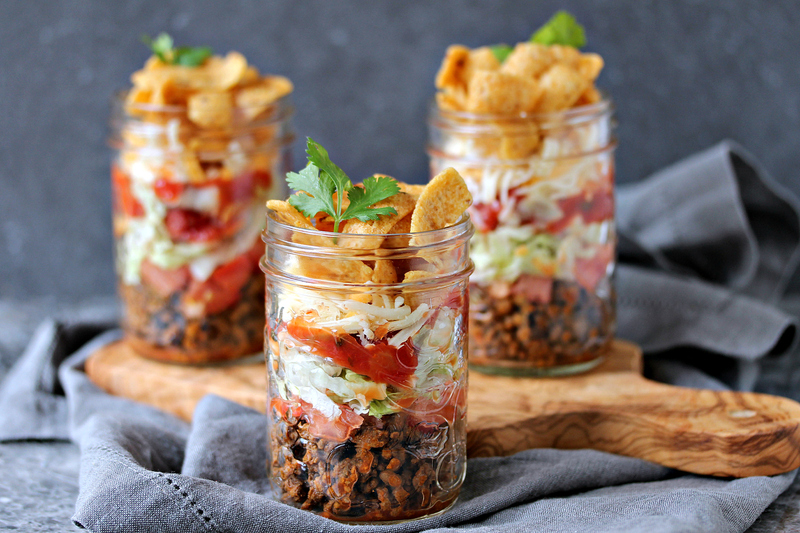 All in one recipes in Mason Jars are my favorite way to eat food now! Seriously, so convenient, so portable, easy to store in the fridge! Soooo cute, this makes eating taco salads all the more fun! Thanks. It really does. Cute food just makes me happy. Oh these bring back so many memories. High school, making them for my kids, I had forgotten how much I love them. They are going on my must make list right now! Fritos are one of those things that I can never buy because I will sit down and eat literally the entire bag by myself. 🙁 But having an actual recipe that I have to make with them sounds like a good enough reason not to eat them all. These look so delicious! And fun. I agree they are the perfect treat for summer. I will make it for a playdate we will have at my house this weekend. Love fritos! Everything’s more fun to eat in jars. I’d need lots of extra Fritos on the side. We call those Walking Tacos in our house, and they are a huge hit! Fritos are the best chips ever made. I would’ve been singing and dancing right along with you. My dad would be all about the Catalina dressing but I’m more on the Italian dressing side haha. These look perfect! ps your photos are beautiful! You know how to make taco salad look AWESOME! 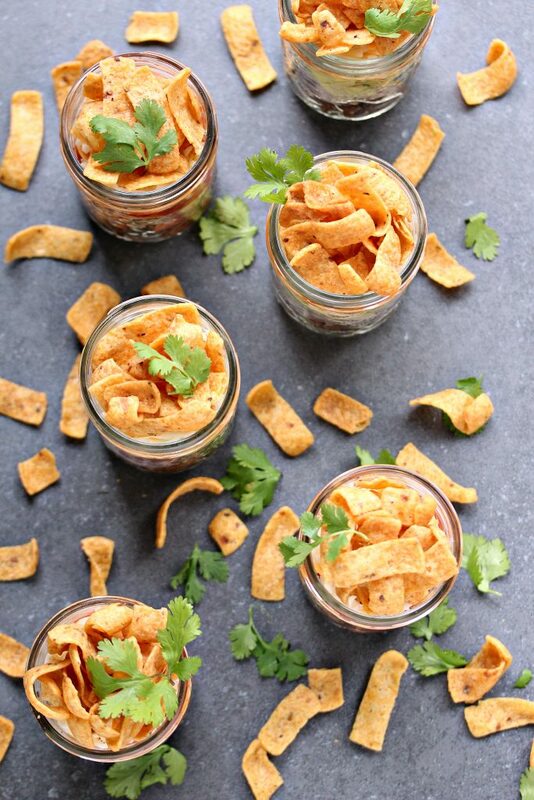 Love the jars AND the Fritos! Oh man, these look so gooood! i love that this can be portable. Seriously everything you make is delicious! Pinning! I am not sure I could have remained as professional. I LOVE Frito-Lay and could eat Fritos every single day and not get tired of them. This salad is perfect, and I love the jars! I actually have a little bag of fritos and leftover taco meat set aside for my lunch tomorrow. Holy adorable! It’s a perfect way to spice up the usual BBQ sides AND waaaay cuter than doing it taco-in-a-bag style. Totally loving this! Awe, thanks so much Karly. I am so addicted to mason jars. They make me way too happy. Football season is upon us and these could not be more perfect for game day! Can’t wait to make them! What a tasty looking idea for a picnic. I am drooling! Great idea for a summer party! And your pictures are so beautiful! Thank you for sharing at Merry Monday. These would be so perfect for a party! Thanks for sharing at Welcome Home Wednesdays! Love this idea! Great to take on a picnic or other event. Thanks for the idea! I love this idea and will definitely make it for my friends and family one day soon. However, I’m having a blond moment though. How do you eat this? Do you dump the salad into another bowl/plate or dig right in? Are we scooping with the Fritos or using a fork? Thanks! Ha, it’s a good question Renee. And don’t worry, I’m blond too. You can leave a gap at the top and crush the fritos over top of the jars, that is what we do when travelling. You can use a bigger jar and fill halfway as well. Or you can dump it into a bowl or plate. When I do big batches I’ll fill a monster size 1L jar halfway, then shake it and pour it out, or let people spoon it out. But if you’re using them in the jar don’t fill all the way to the top. Leave some room for the fritos to go in. You can also layer them in small layers so you can eat them right out of the jar. I know it’s sort of misleading with the photos where they’re filled. I’ll make them again soon and add a how to in the post so it helps people out. Thanks for taking the time to comment. It’s much appreciated. They say for every person who takes the time to email or comment it represents 1000 other people. So if you feel this way it means others do as well. So it’s definitely something I should make clearer. Hoping to make a video to go along with this soon. Just polishing off my new camera and learning to use it first. Ha. Very good, I loved it! If you want to serve them cold, do you add the dressing while they sit in the fridge? I missed this comment somehow. Sorry about that. You can add it before or after. Just be sure not to add the chips until just before serving so they don’t get soggy.